Around 7:15 last night, we decided to head out for our second round of trick-or-treating. I stood on the sidewalk watching our youngest child and her friend and our oldest child and his friend walk up to strangers’ homes and ring the doorbell. It’s kind of crazy, when you think about it, that on this one night of the year, you can knock on someone’s door at night, dressed in masks and costumes, and people will actually give you candy! I’m not the biggest fan of Halloween. I actually look forward to Nov. 1 when the neighborhood can put away all of the skeletons, bats, ghosts and spiders from their front lawns. But I have to say, I have grown to love a lot of things about this spooky holiday. I love how it brings people out of their homes to spend an evening walking around the neighborhood. I love those moments when you ring the doorbell and realize it’s a friend from school and you didn’t even know they lived down the street. I love how people are generous and kind even when one of my older kids come knocking at the door. I love to see kids use their creativity to dress up. As kids get older, Halloween can become such an awkward thing. Last night, our Halloween took on many different forms. The third grader is still totally in the spirit of getting dressed up. However, even at 8, she has outgrown the days of being a princess. 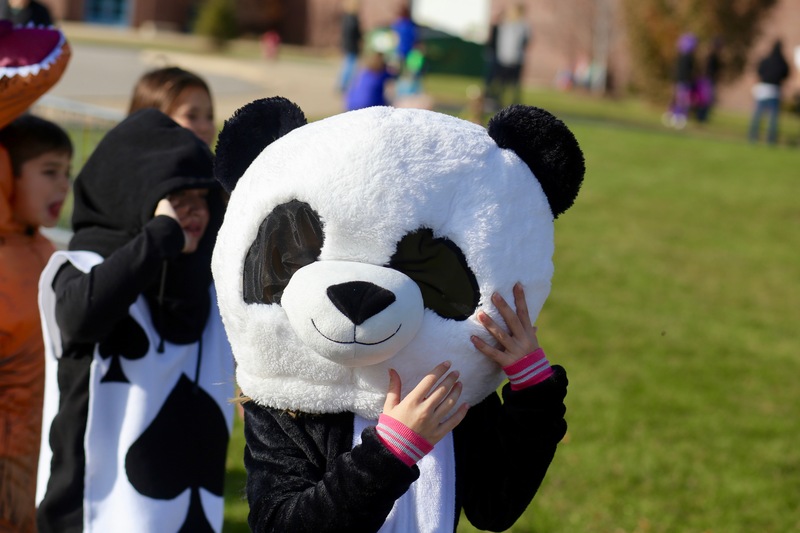 I thought she was the cutest panda ever this year, but she worried she might be the ONLY animal in her class. Our freshman put on a flannel and a baseball hat and said she was dressed as a boy, although she just looked like herself on a normal day. 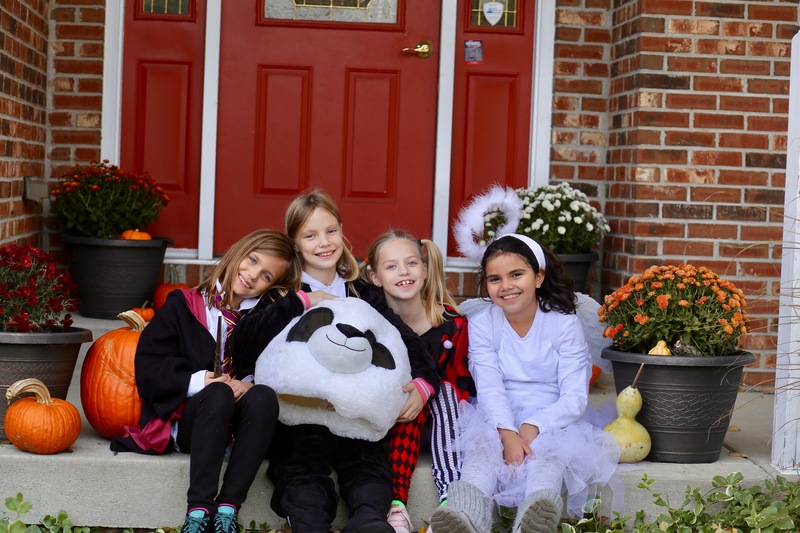 She went out with friends for 15-minute intervals and didn’t seem to collect much candy. At one point, she left with three friends and came back with nine. My husband and I frantically baked pizzas at her request, but we were happy to have an invasion of teen-agers in the house. Our sophomore treated it like any other day. He played Fortnite for a while, then headed over to hang out with an older friend. He is a rebel from most teenager traditions, and I am learning that is totally fine. 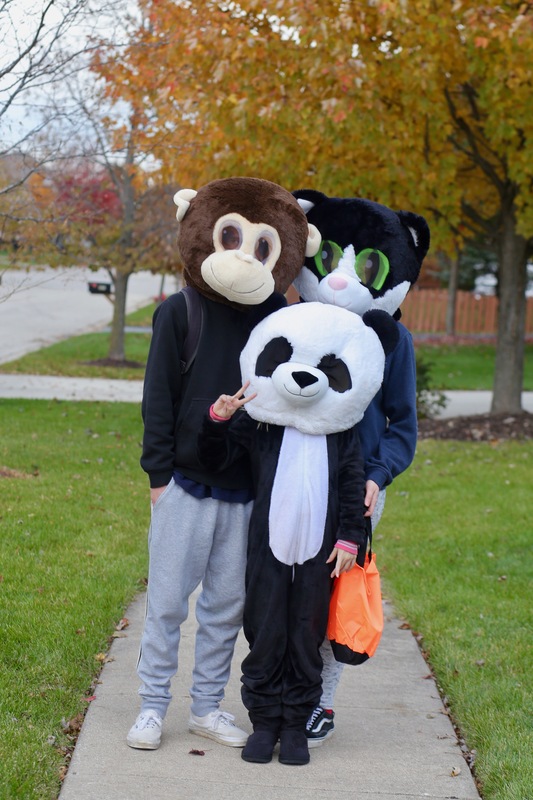 Our senior and his girlfriend tagged along with the 8-year-old and her friends, wearing giant animal heads. The younger kids gave them a great excuse to still enjoy collecting candy. I was so thankful at every house they approached that they were never reprimanded for being too old to walk the neighborhood. A few neighbors rewarded my monkey son with a pat on his big plush head. I guess the sewn-on smile made him look friendly and approachable. Honestly, I’m OK to say good-bye to another Halloween. It seems that all of our holidays are becoming these huge events, thanks to social media. Halloween is no longer a single day for trick-or-treating. I feel like it’s been a month of parties, parades and anticipation. But I’ve also realized over the years that I want to embrace the moment. I don’t know how many more years our house will be full of kids on the last night in October. I’ll miss the oldest like crazy next year when he’s away at college. We only have a few more Octobers that our little will want to dress up and be OK with me tagging along. I love that she gives the whole family an excuse to still jump in on the festivities. How about you? Do you love Halloween or can’t wait until it’s over? 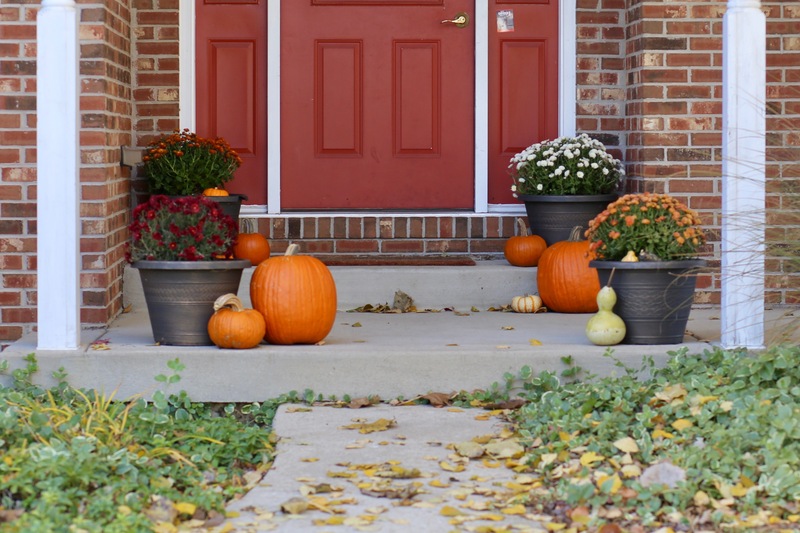 I’ve always loved Halloween – it was my favorite holiday even over Christmas as a child! – but Halloween here has changed for us the last couple years, too. Last year was the first year I didn’t walk around with my kids for trick-or-treating: Annelise went with a friend, while Will actually had a football game. Halloween night last year was rainy, as well, so even after football, Will just ran out for 20 minutes to see how much candy he could get while still wearing his football uniform. 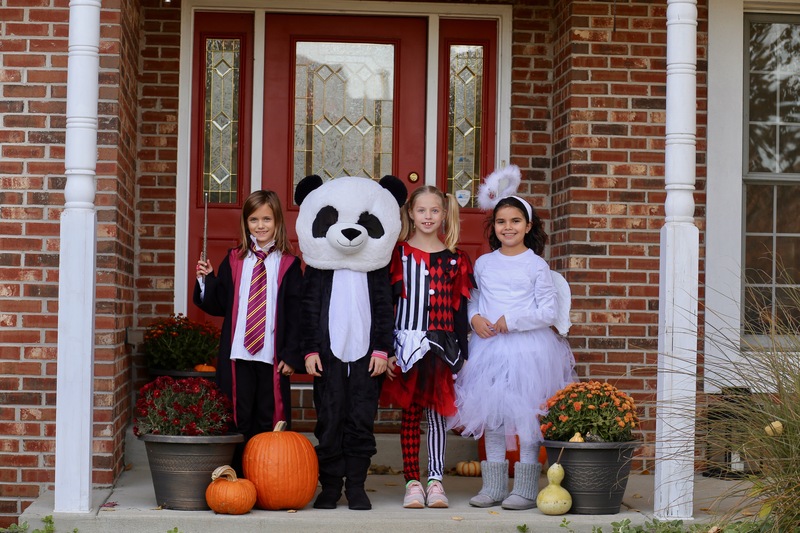 🤣 This year, Annelise went trick-or-treating again with her best friend (who has a third-grade brother, so he provides the perfect excuse!) Will went raiding around the neighborhood with three of his friends in masks. All Will cares about is getting candy. Annelise wants all the candy, too, but she’s extra excited to hang out with her BFF. It feels weird that Halloween is a more separate, individual occasion now, instead of a huge family affair.